One of the best ways of securing a mitre joint on a box or carcase is by fitting biscuits, but even with the proper mitre fences in place, cutting the necessary slots can be a bit hit and miss if you try and use a biscuit jointer. 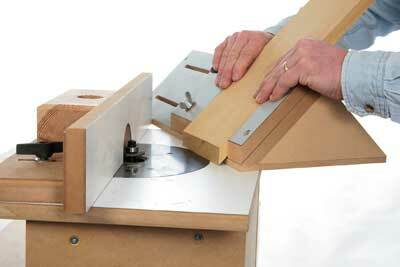 This simple jig overcomes the need for the biscuit jointer altogether and instead uses your router and an inexpensive cutter. 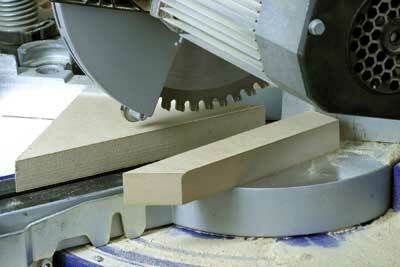 It is just a means of holding the work at precisely 45 degrees to a horizontal slotting cutter mounted in the router. 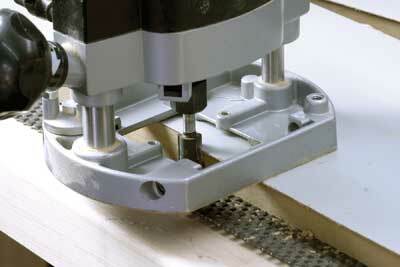 It is one of the easiest jigs to make, but does require you to have the router mounted in a table of some sort. There is very little precision involved either, a few accurate 45 degree cuts and make sure the material stop on the jig is at 90 degrees to the table surface and the joint becomes foolproof. 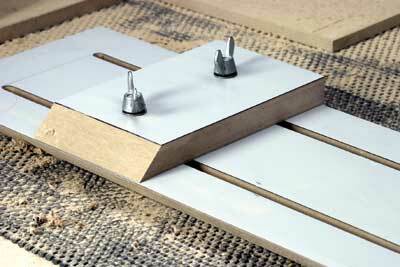 The support board has to be fixed at a true 45 degrees to the base, so start by planing this angle along one edge. The supports for this also need to have a 45 degree angle so ideally cut these on a chop saw, but do check the angle produced, it may not necessarily be spot-on straight off the saw. 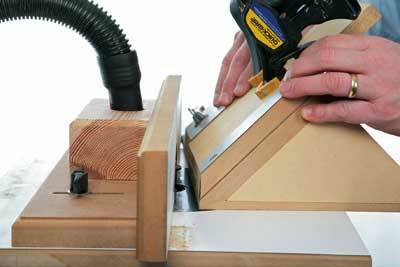 A tight sueeze in the vice often helps the bonding process. 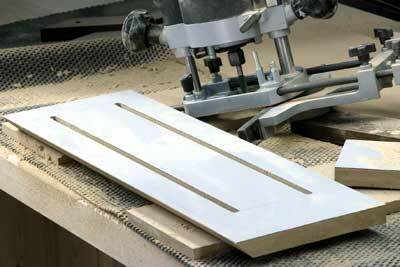 Then use a straight trimmer in the router to cut back the excess to a perfectly flush finish. The support board needs to slots to take the adjustable stop, so cut these with a straight cutter suitable for the bolts. 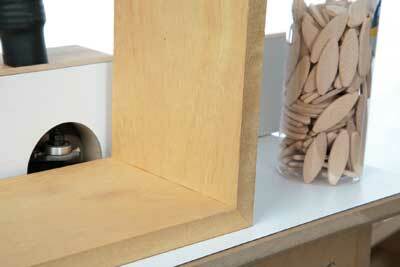 The coach bolt head needs to be a sliding fit in the slot, but not so loose that it can turn. I used an 8.5mm cutter for 8 mm bolts. 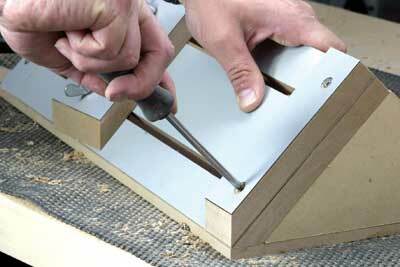 Use the side fence to guide the cutter, and mark the start and stop positions with a pencil line. A deep cut like this with a narrow cutter will have to be made in several passes, or there is so much vibration that the cutter chatters and may even snap. 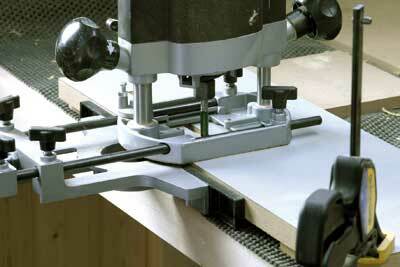 A cut of 5 mm at a time is plenty deep enough, and with a little care you should end up with two perfect slots. 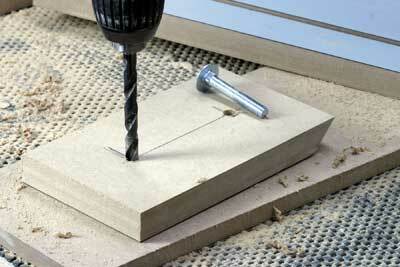 Use these slots as a template to mark and then drill the bolt holes in the sliding stop. 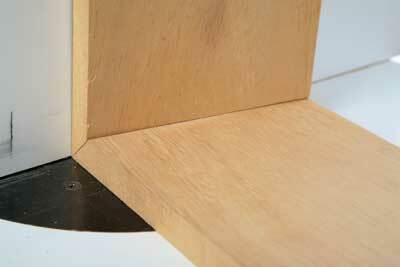 This stop and the fixed one also need a 45 degree chamfer cutting on the end. 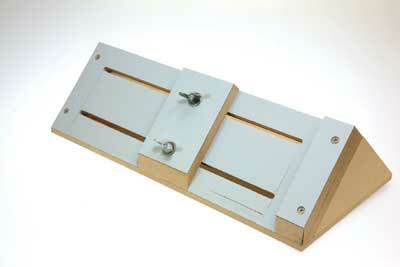 With the bolts and wing nuts in place the stop should be a nice sliding fit without being too sloppy. The angled supports need to be screwed to the base from the underneath, a little PVA glue will help to hold it all rigid. Then turn the jig back up and fix the support board, screwing through the end stop as well at the one end, and just through the support board at the other. This fixed end stop must be at 90 degrees to the edge of the support board or the biscuit slots will be angled, this is the only crucial part of the making. 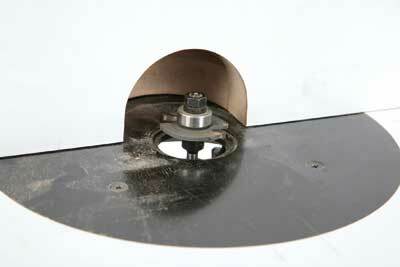 The router has to be mounted in a table and the height of the cutter adjusted until it is in the centre of the mitre joint. 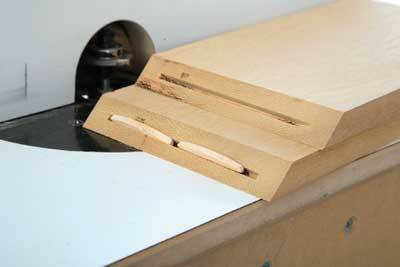 A fine height adjuster on the router makes this much easier. I initially just hand held the work in the jig, extending it down onto the table and used the bearing on the cutter to control the depth of cut. 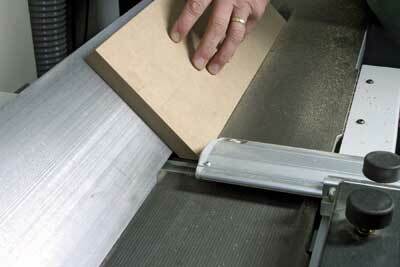 A few trial cuts soon showed up a tendency for the work to 'creep' as it was pushed into the cutter. This means the slot ends up slightly over- width so the effectiveness of the biscuit is lost, and the joint also goes slightly out of square. Instead set the work back in the jig so it lines up with the edge of the jig and use this edge as a guide against the table fence to control the cut. 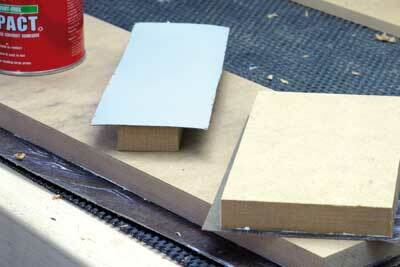 Put some pencil lines on the table fence to give you the start and stop positions. 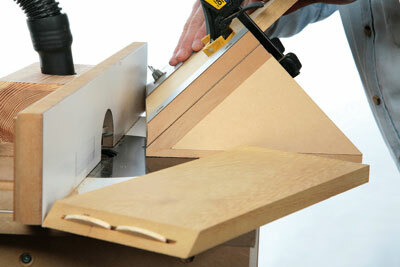 You will also need to clamp the work firmly onto the jig to eliminate any movement; it must stay fixed in place during the cut. 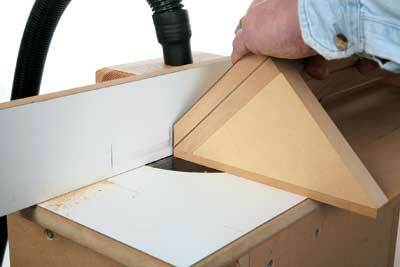 With everything firm, just gently push the whole assembly onto the revolving cutter. 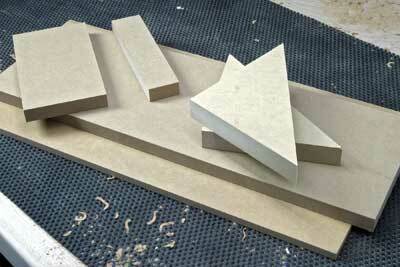 With the weight of the jig and the massive area to hold, there is little danger of kick back. 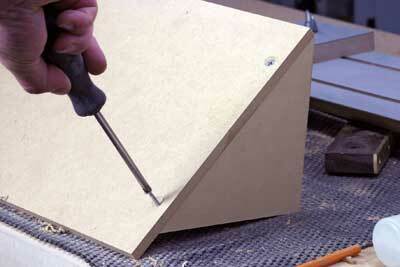 The result should be a perfect, clean slot in the mitre. Repeat the procedure for the other part, the pencil lines will ensure you get the matching slots the same length. The end result is a really strong and 'frustration free' mitre joint that locates perfectly and is dead easy to glue up because it cannot slide about. 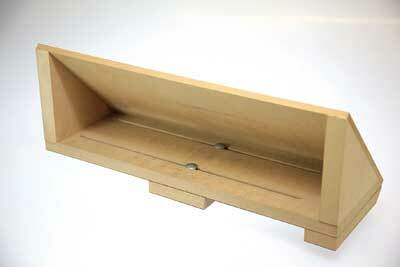 "The end result is a really strong and frustration free mitre joint"